Star Wars 9 begins shooting next month, but it doesn't look like Benicio Del Toro has received an invite to reprise his role as DJ. The actor said in a recent interview that he would like to do more Star Wars movies as well as another Sicario sequel, noting that his schedule is wide open at the moment. Del Toro is currently doing press for Sicario: Day of the Soldado, which hits theaters this weekend and it appears that the actor might have the rest of the summer off. There have been many rumors and supposed leaks from the production of Star Wars 9, and a few have featured Benicio Del Toro's DJ character. However, it seems that Del Toro has not been cast in the third and final movie of the trilogy at this point in time. That could change over the course of the next several months, but for now, Del Toro does not have any involvement in Star Wars 9. When asked if he was returning to a Lucasfilm production or another Sicario role, Del Toro had this to say. "I have no answer for those, not because I'm withholding information, but there's nothing on my plate right now. But would I like to? Yes, sir." 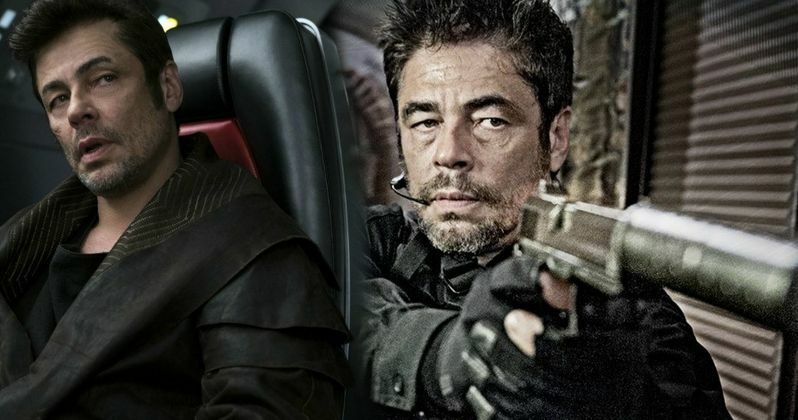 While Star Wars 9 could still happen for Benicio Del Toro, Sicario 3 seems like a slam dunk. Sicario: Day of the Soldado screenwriter Taylor Sheridan has revealed that he already has ideas for the third installment. The sequel's director Stefano Sollima also confirmed that there are plans to make a third film, but he is unsure if he will remain on board to direct. Additionally, there have been rumors that Denis Villeneuve will return to direct after passing on the sequel. DJ was not a huge character in Rian Johnson's The Last Jedi, but he was a fan favorite, and many are hoping to see Benicio Del Toro return to the role. DJ is a bit of a mystery and isn't easily placed into a category of a good guy or a bad guy. He seems to be an opportunist, but there were hints of goodness in him. Will Star Wars 9 give Del Toro's DJ character redemption after selling out Rose and Finn? We'll just have to wait and see to find out. J.J. Abrams is gearing up to begin shooting Star Wars 9, so it would seem that Benicio Del Toro would at least know by now if he had a role in the film. On the other hand, Del Toro could have been instructed not to say a word, which isn't too far-fetched for a Lucasfilm production. The third and final movie of the latest trilogy will have a lot of secrets, but with production due to ramp up in a few weeks, we should know whether Del Toro is involved or not in the near future. Check out Benicio Del Toro talking about the Star Wars and Sicario franchises below, thanks to the Variety Twitter account.